MEXICO CITY, Oct 25 2012 (IPS) - Greater integration of public passenger transport is a major challenge facing the next government of the Mexican capital, one of the most traffic-congested cities in the world, if it wants to guarantee people the right to mobility. The authorities of the Mexico City Federal District have invested billions in collective transport, but have failed to create a balanced, multi-modal transportation system. “Part of integration is physical – making it much easier to move from one system to another,” said Bernardo Baranda, the director for Latin America of the Institute for Transportation and Development Policy (ITDP). “It also has to do with the design of stations, and improving the integration of multimodal transport,” Baranda, whose office is based in Mexico City, told IPS. ITDP, a U.S.-based non-governmental organisation that provides technical assistance to cities on sustainable transportation development throughout Asia, Africa, and the Americas, advises the Mexico City government. In the metropolitan area of Mexico City, made up of the Federal District and several municipalities in the surrounding Mexico state, there are 49 million daily trips, of which 53 percent are carried out on public transport and 17 percent in private vehicles, according to the Centre for Sustainable Transport for Mexico City (CTS-Mexico). The transport system in this area of over 20 million people is made up of buses, minibuses, the Metro Collective Transport System and the Metrobus, which are often disconnected from each other. They transport 14.8 million people a day. Mayor Marcelo Ebrard of the leftwing Party of the Democratic Revolution (PRD), in office since 1997, will be succeeded on Dec. 5 by his PRD colleague Miguel Mancera. The metro system, with a network of 11 lines totalling 201 kilometres, moves five million passengers a day, a number only surpassed by the 6.8 million people who travel in private cars, according to figures from the road and transport secretariat. The Metrobus, with four routes and a total of 95 kilometres, transports some 800,000 passengers a day. Among the main factors contributing to the lack of integration in the expanding public transport system is the proliferation of shanty towns on the outskirts of Mexico City, according to experts, who are offering the next city administration different formulas for creating a more humanised mass transit system. “A major concern is the lack of public policies for controlled urban development,” Daniel Zamudio, an expert with El Poder Ciudadano (Citizen Power), told IPS. “Continual housing development means journeys are getting longer and longer, less safe and more costly,” said Zamudio, the public transport coordinator for the NGO. 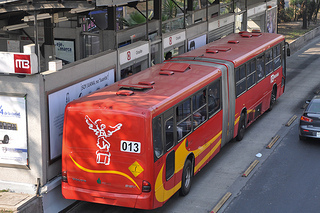 In its comprehensive transport and mobility programme for 2007-2012, the government of the capital promised to create 10 routes for Metrobus and a bus rapid transit (BRT) system with pre-paid cards, exclusive lanes and articulated vehicles. But only four Metrobus routes were built, and the authorities opted instead to build the 12th line of the metro, 24 kilometres long, at a cost of two billion dollars, to link the west and east sides of Mexico City. It is about to be inaugurated. Ebrard also chose to build new stretches of elevated highway, which promote the use of private cars, according to critics of this move. Total public and private investment in transport infrastructure has amounted to 4.7 billion dollars over Ebrard’s six-year term. Even so, some of the plans for 2007-2012 remain pending for the Mancera administration to complete. “We must ask the incoming government to be more aggressive in expanding Metrobus and improving current operations. The priority has got to be quality public transport. Work must begin in the most underprivileged areas, like the east of the city,” Baranda said. On Tuesday Oct. 23, ITDP presented a plan titled “Perspectivas de crecimiento de la red de Metrobus y transporte integrado del Distrito Federal a 2018” (Prospects for growth in the Metrobus network and integrated transport in the Federal District to 2018), which proposes annual growth in the system of between 25 and 30 kilometres and the addition of 10 new routes by 2018, benefiting two million additional passengers. The report estimates an annual investment of 117 million dollars. In 2013 a network linking the east and south of the capital could be built, a project that the city government has already planned. The 10 new routes would save 290,000 hours a day in commuting time; signify a reduction in emissions of 11,000 tonnes of carbon dioxide, one of the greenhouse gases responsible for global warming; and reduce traffic accidents by 30 percent. “It is necessary to create additional routes that feed into the Metrobus system, so that more people will start using mass public transport. Furthermore, bus stops and metro stations must be restructured to make them accessible and promote the right to mobility,” Zamudio said. Since Oct. 17, commuters have been able to purchase the Federal District card and use it to ride both the metro and Metrobus. In future, it will also be possible to use the card to pay for bus transport, taxis and parking meters, as well as to rent bicycles. Mancera has already been given the “Acuerdos para la Movilidad” (Agreements on Mobility) drawn up by “Citizens with a Vision,” made up of six civil society organisations that suggest expanding, modernising and integrating a quality public transport network. They also point out the need to consolidate a legal and institutional framework for better public transport. In terms of mobility, the group recommends articulating urban development and mobility policies; moving towards a more compact and orderly city; and achieving efficient and sustainable public investment in transport. The measures proposed by ITDP would improve public spaces and passenger safety, reduce transit times, expand coverage by the mass transport network, decongest saturated transport corridors and improve the connectivity of the network. “Mobility problems are solved by prioritising public transport. A good transport system serves the needs of the people,” Baranda said.